I’m a strong believer in early literacy. I started reading board books to both my daughters when they were three months old. We didn’t always get through the whole book (on a good day we read three pages!) but I kept at it until we were able to finish a whole book, and then move on to more and more reading! These are a couple our favorite lift-the-flap books. Not only do they have sturdy flaps that will never tear off, they have sturdy “action tabs.” They are also touch and feel books, with wonderful textures on a variety of animals. They are like getting three books in one! I love the bristly, yellow bees, which have the rough side of Velcro for their texture. There is a huge variety of textures from sticky octopus tentacles to the squishy insides of a clam. And of course, plenty of sturdy flaps for your child to open! 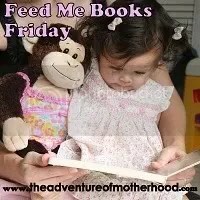 Janna over at The Adventure of Motherhood is hosting “Feed Me Books Friday,” so if you would like to read about more lift-the-flap books, click on her button below! ← What’s in Your Mug Today? I need to get that first book. My kids are INSANE about peacocks. We even go "peacock spotting" in a neighborhood a mile or so away because they have about 50 that live there. Thanks for the recommendations! oh! i love books with flaps! er…. i mean, my toddler loves books with flaps. yeah, that's the ticket! I love when other parents give suggestions of books that they've enjoyed with their children. We go to the library 2x a month and I'll be sure to see if they have these books you mentioned! Oh yeah I'd have been all over those books as a kid! I've never heard of pangolin either! What a darling book! I miss those sweet kind of books! But I still have a basement full of them. Just loved this post… coming from SITS. Random, but are you going to Bloggy Boot Camp in Baltimore? My son ripped the tail off on the swatting pig page. Our Tails book is well-loved. Both books look wonderful! I love this blog hop! I've learned about so many new children's books this way.Have a great weekend! Oh, I am relieved that I'm not the only parent who got to the end of "Tails" and went, "Pangolin? Huh?" LOL! I am glad to hear about the alphabet book here – I've been eyeing it on Amazon for awhile now. It's cover is so much like the one on Tails that I wasn't sure if a family needed both in their library. But I think that we might now! that looks like a great one!!!! Those sound like great books! I'll have to get them for my girl too!Happy Friday! These books sound wonderful. I love the abc book. Thanks for stopping by. Oh, I totally need to do this. I have a million books to recommend. LOVE kids books! I will have to remember these when I am looking for gifts for small children. My daughters favorites were like that. I will have to look and see if I have one of them.Your girls would love it. I see that you are Mara have become friends. Hooray! thanks for stopping by – the Tails one looks very cute, and I have two animal-obsessed children, so would be a good addition here.